Have a craving for Marley’s amazing pizza but want to dine at home too? No worries, we’ve got you covered! Carryout – call us at 479-301-2815 to place your order with an awesome staff member! They will be able to give you an estimated pick up time to enjoy piping hot Marley’s pizza! Take-N-Bake – call us at 479-301-2815 to place your order with an awesome staff member! We do need a 24 hour advance notice for our Take-N-Bake service. Delivery – Use any of the convenient services below to order delivery of our amazing Chicago Style or hand tossed pizza. Keep in mind, our Chicago Style pizza takes longer to prepare and cook than our Hand Tossed crust. Schedule accordingly. Catering – Let Marley’s cater your next event, corporate or social! Call us at 479-301-2815 and ask to speak to the manager on duty. She or he will talk with you about what your best options and quantities are. Delicious delivery! 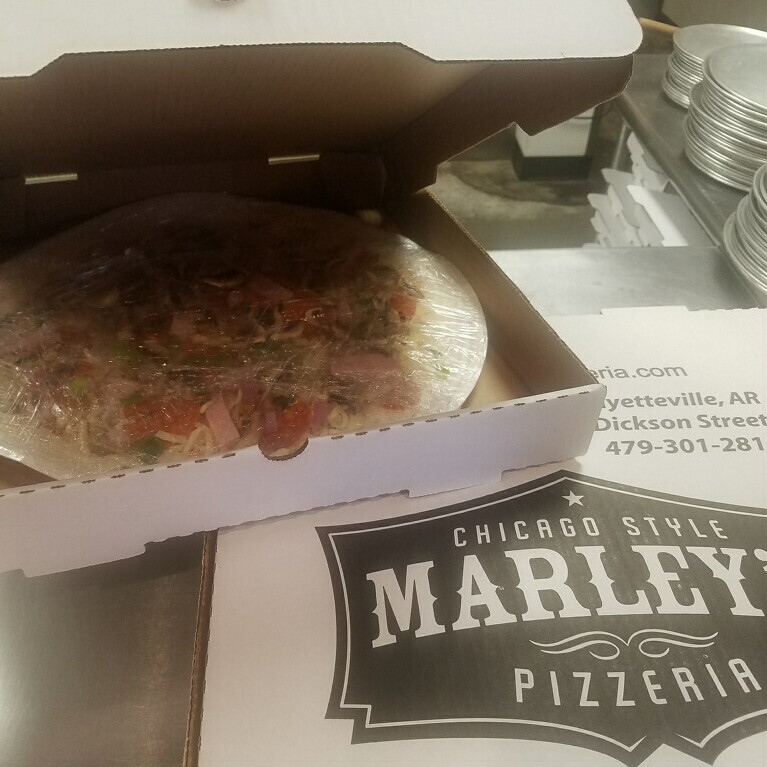 Pizza was hot on arrival and our first taste of Marley’s did not disappoint. Loved the sauce, which is a little thicker than most pizza places. Great tasting crust, toppings, and cheese as well. We did a build your own but can’t wait to try their specialty pizzas! We have a lot of great pizza in Fayetteville, but Marley’s is my favorite these days. Both the hand tossed & the Chicago style are awesome! The cheese is so good, it’s just the perfect pizza. A bit hidden, but you simply much go and try it. They have a great lunch deal too for personal pizzas.